I usually don’t plan my routes on any routing software and then upload it on my Garmin Zumo GPS. One reason is because I don’t plan much, just day by day, and then also because I am a bit lazy to start up my computer just to make a route for the next day. Many times I actually just use my iPhone to navigate since it is just so much more easier to handle. Hello Garmin, TomTom etc… how about creating something useful like an app where you can quickly put your route together and send it to your GPS with bluetooth? Anyways, I still use my Zumo 390 since it is better readable in sunlight and easier to use with gloves, although I can actually control my phone with my gloves too. Not sure if it’s the specific type of leather or just all the sweat in there that makes it possible (no my gloves do not have specific threads to make this work). So what I do regularly is to enter a target by GPS coordinates o my Zumo. 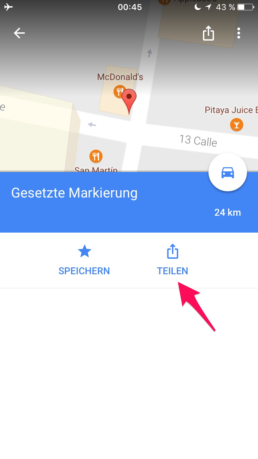 I use Google Maps a lot on my phone to search for places, either with the search or just visually on the map to find out where I wanna head to. On the desktop computer you can simply drop a pin and then click it to see the coordinates, but on the iPhone app it does not work just like that. I initially found a place in Google Maps where I wanted to head to, then opened Pocket Earth app and found the location on the map to get the coordinates. But that’s still cumbersome to do. Note: If your are an Android user you can ignore this since the Google Maps app on Android gives you the coordinates straight away! Next idea was to drop a pin in Google Maps and then share it through a message or email. This would give me a short type URL that I could then paste into the browser on my phone and then see the coordinates. This however only works if you have a data connection and it only works with “freely” placed pins, not pins on any named location. But here is how you can get coordinates very easily out of the Google Maps app on iOS, without the need of being online or using any other apps, actually not being online is the simple key! Just go through the pictures to see how it works. Sorry my iPhone is still running in german, but you get where to click. 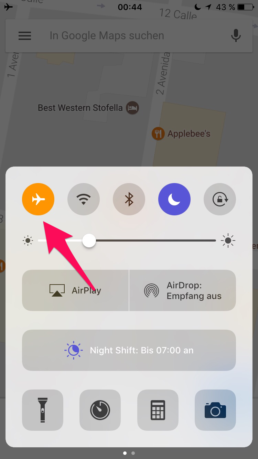 This is the important part: Put your iPhone to flightmode (if you have a wifi or data connection running). Open the Google Maps app and drop a pin where you wanna go. Make sure it is not a named location (e.g. 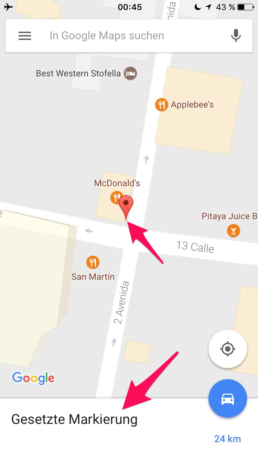 Mc Donalds or a street address), if that's where you wanna go drop it just next to it so that it say "dropped pin". Click on the bottom of the screen to open the info. Then choose "share". Et Voilà! Here is a link with some coordinates! 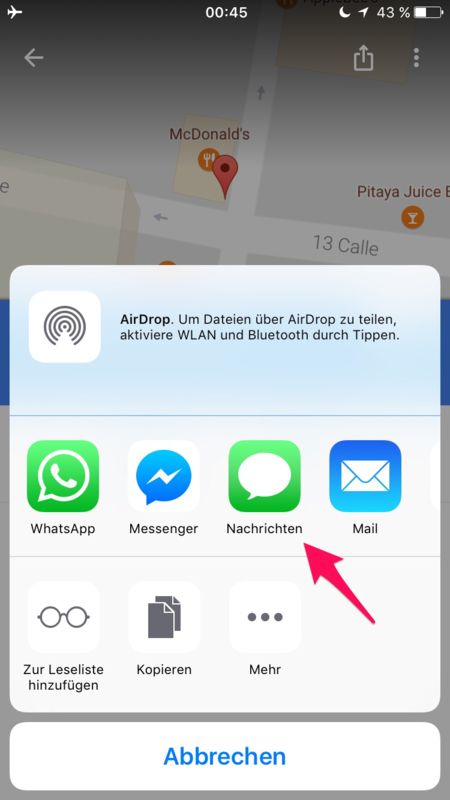 Use in other apps or just use them in your dedicated GPS. Note: If your system gives you a short link (no coordinates embedded) then paste the link into your browser (delete everything before “https:”) and go to it. 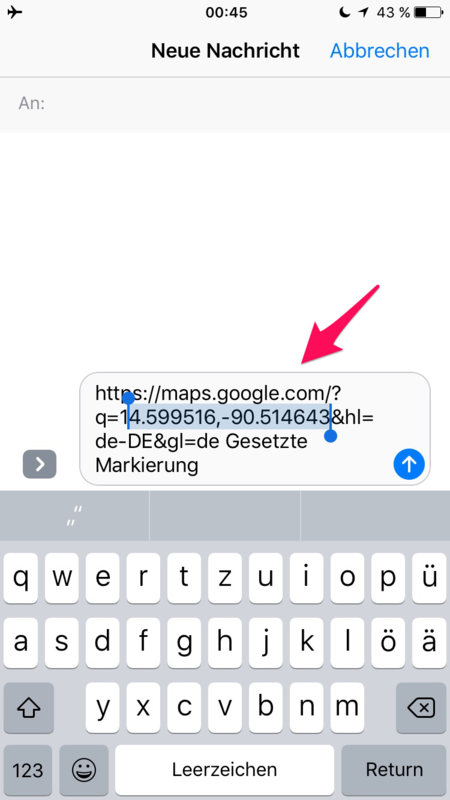 The normal URL will show the coordinates now.